In the past I’ve recommended two books on geo-spatial data analysis and presentation: Designing Better Maps by Cynthia Brewer and GIS Cartography: A Guide to Effective Map Design by Gretchen Peterson. 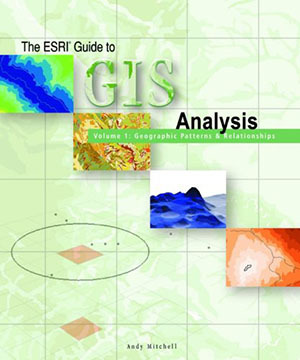 Today I’d like to add a third to the list: The ESRI Guide to GIS Analysis, Volume 1: Geographic Patterns and Relationships by Andy Mitchell. As someone who knows a great deal about data analysis and visualization in general but a limited amount about geo-spatial analysis in particular, I learned a great deal from this book. It was useful to have several gaps in my knowledge filled in as Mitchell took me on a superbly organized and simply expressed journey through the fundamentals. If you’re new to GIS and want a good primer to start the journey on the right foot, I highly recommend this book. Andy Mitchell is a well-known author and teacher in the GIS world. Your review brings back memories of several of his works, which we have used in our Business Analytics practice. Thanks for waking up the little gray cells. Moreover, the concepts are useful references whenever thinking about data analysis, since 70%+ of business and government data (or as much as 100%, depending on who you read), is spatially important. Spatially components for popular DBs, like PostGIS, for PostgreSGL, make the implemenation of these concepts accessible to many more analysts than in the past. And tools, like Tableau can readily take advantage of the power of place, to anwser questions business need to ask in order to do better. By the way, on a slightly related matter, let me shamelessly plug the excellent summary of your keynote at the Tableau Customer Conference (July 20-23, 2009): http://www.tableausoftware.com/blog/stephen-few-data-visualization. thanks for getting the word our in regards to geo-spatial analysis. Filling the gaps of ones knowledge is important and providing the resources for learning this important technique is even more important. As Michael Cristiani ( @mcristia ) mentioned, 70%+ of business data is spatially important, so knowing how to work with this data is very important. The number of people versed in these concepts is minimal but the number of people using this data is large and that is a scary thought. Mark Monmonier’s books “Mapping It Out” and “How to Lie With Maps” are also quite good.